Confused about a Microsoft account? You probably already have one. - Ask Leo! 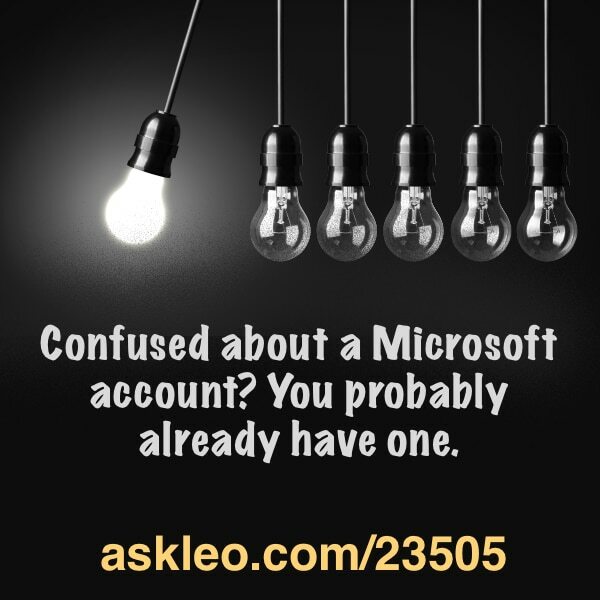 Confused about a Microsoft account? You probably already have one. What Does Signing into My Microsoft Account Really Mean in Windows? - Microsoft certainly makes things confusing. First, let's sort out the difference between logging into your Microsoft account and logging into your computer. How Not To Get Locked Out of Your Microsoft Account While Traveling - I tried to get locked out of my Microsoft account while travelling. I couldn't. Why? I'd prepared. Prepare properly so you won't get locked out. « Previous post: Given the increased importance of Microsoft accounts, losing access to that account can have dramatic and dire consequences.